Psychotica (2019. Kindle Edition) is a new genre crossing novel from Ty Power. 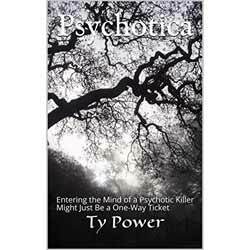 The title is a little misleading as the main antagonist is not traditionally psychotic, he is probably personality disordered or suffering from a form of psychopathy (which is different), but I can understand what the author went for the title as the other, more accurate titles would be less likely to grab a reader’s attention. Of course, the main character does talk to a statue, but given the other fantastical elements I was never sure if this was supposed to be actually happening or whether it just resided in the killer's mind. Regardless of his formal diagnosis, Merlin, the main antagonist, is a well-drawn character. We are introduced to him via a set of tapes he makes, which allows the reader to get in to the mind of a killer, the reason for the tapes is never completely explained, but their existence becomes vital to the plot later in the narrative. At first we are not given enough information to work out whether the tapes and the investigation into the death run concurrently, which is a nice structural touch as interest is piqued as to where and when these two elements are likely to collide. The genre crossing elements of the plot, for the most part, hang together well, although the unexpected twist into a court case, was for my taste, one element too many in a book already full of cowboy attired professors, limbless policemen, talking angels and mutant supermen. The transition, three quarters through the story, felt like the main content of the last quarter could well have been incorporated without this addition. With this in mind, there is a large amount of suspension of disbelief required. The chapters have specific point of view characters and so the story has a number of equal protagonists with a smattering of deuteragonists and few tertiary characters. For the most part this works well, especially allowing the audience into the mind of the killer and the relative shortness of the chapters allows the pacing to remain brisk. There were few issues with the text itself, only a couple of misplaced words and it takes the text a little time to decide on its naming conventions, on one page Adam Douglas is referred to in his full name as well as Adam and Douglas, which felt a little messy. Overall, personal stylistic choices aside, I thought it a good novel, especially in its portrayal of the main antagonist.